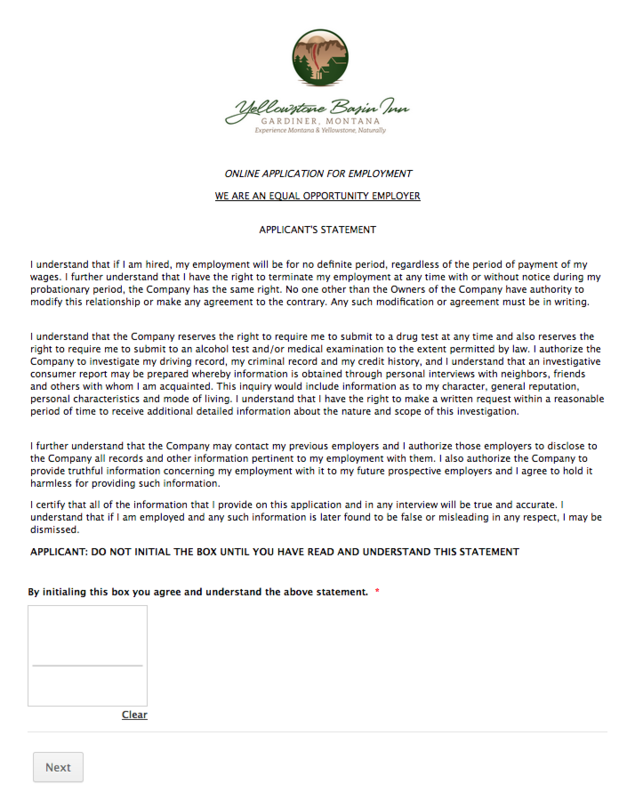 Thank you for your interest in working at Yellowstone Basin Inn! For our open positions please see below. We hope that your time with us in Gardiner, Montana and Yellowstone will be unforgettable, challenging, enjoyable and rewarding! Do you like cleanliness and neatness? Do you like to work in a fun and relaxed environment? Do you enjoy interacting with visitors and international student workers who come to Southwest Montana? ...then one of these jobs is for you! You don't have to live here to work here. Yellowstone Basin Inn is an exceptional 14-room family-owned Montana lodging establishment. Working here isn't your typical 9 to 5 job. We strive to make all of our employees feel at home and that your time spent here is extraordinary. Outgoing, friendly, reliable, enthusiastic, hard working, flexible, a team player, willing to learn and is interested in the Greater Yellowstone area. Able to work from May through October for our summer seasonal positions. Each job is little bit different and specific employment dates and schedules are worked out during our interview. Understanding that Yellowstone Basin Inn is a very small family operation, we frequently ask employees, both seasonal and year-round, to perform jobs other than the job for which they were hired. Please review the positions below, then fill out the Online Application found HERE, and attach a current resume. Applicants may have to pass a background check. Employees may have to pass a drug test. Hiring for our 2019 season begins December 2018. Click on a position below to see more information. TO APPLY: Submit the online application form above. Hours vary: may have to work mornings and/or evenings and split shifts during training. 40 hours per week, 5 days. This position is responsible for assisting the Innkeepers with running an exceptional Montana lodging establishment and providing excellent customer service full-time. Must be able to work holidays & weekends, from May 1 through October 21. Starting wage is $13.00 per hour or more based on experience. Do you dream of: practicing the art of hospitality or running an inn or B&B? We will train and mentor you in all aspects of the business—and pay you too! After a successful season and with the right person this position will transform into the manager position. It will become a 10-11 months/year job, with paid and unpaid personal time off and insurance. This position is part of a team and substitutes for other positions as needed throughout. You will be cross-training and work: Front Desk, Concierge, Guest Services, Food Service, Housekeeping, Maintenance, and Employee Relations. We provide extensive property-specific training. Must be guest services oriented, clean and neat, self-reliant, detailed oriented, as well as have the ability to see the big picture, work well with the rest of the staff (some of whom are international students) in a team atmosphere in a self-directed environment. BREAKFAST BUFFET PREP COOK/BAKER & LUNCHES-TO-GO PREPARER: One position. Hours: 6 am – 2 pm. 40 hours per week, 5 days. The cook works full-time. Must be able to work holidays & weekends, from May 1 through October 21. Starting wage is $12.50 per hour or more based on experience. The Cook's job is to enthusiastically assist the Innkeepers with managing an exceptional Montana lodging establishment, providing excellent customer service, offering a phenomenal breakfast experience and Lunches-to-Go to our guests, using local, organic and sustainable products. Do you like to bake and cook? Do you care where our food comes from and how it is produced? You are in charge of our kitchen and we provide extensive property-specific training. other duties are assigned as needed. FRONT DESK / HOUSEKEEPING SUPERVISOR: Two positions. This position is responsible for all aspects of front desk, performing and overseeing housekeeping functions, providing excellent customer service, and assisting the Innkeepers with managing an exceptional Montana lodging establishment full-time, must be able to work holidays & weekends, from May 1 through October 21. Starting wage is $12.00 per hour or more based on experience. The person in this position is part of a team and substitutes for other positions as needed throughout the season. We provide extensive property-specific training. The housekeeper’s responsibility is to enthusiastically assist the Innkeepers with all aspects of running an exceptionally clean Montana lodging establishment and providing excellent customer service to our guests. The housekeepers work full-time. Must be able to work holidays & weekends, from May 1 through October 21. Starting wage is $10.00 per hour or more based on experience. If you are a J1 Work and Travel Program Student interested in this job, you are welcome to apply. Follow our application process above.